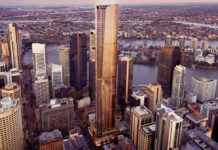 A new 42 storey development at 2 Wharf Road, Surfers Paradise is claiming to be one of the world’s most slender towers. 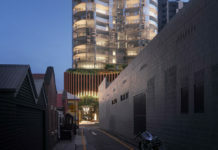 Thanks to the latest advances in parametric design tools and wind modelling technology, Golden Gate Property’s $200 million slender residential tower is now possible to construct. 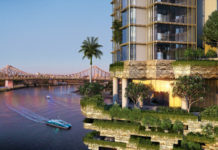 While the Surfers Paradise tower is thin, at just 12 metres, it doesn’t beat Brisbane’s recently proposed 466 Ann Street tower, which is designed by the same architect Rothelowman and measures just 9 metres wide. Rising 154 metres high, the Gold Coast tower just nudges taller than Brisbane’s 466 Ann Street tower which is seven metres shorter at 147 metres high. The Gold Coast tower has one of the tightest slenderness ratios in the world with a ratio of 1:13, on par with Phoenix in Melbourne and more slender than One Madison in New York City (1:12). 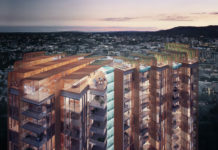 Despite it’s slender skeleton style of design, the tower’s one-per-floor apartments boast very large floor plates with areas ranging from 346 – 414m2 per apartment. The design is the brainchild of Jonothan Cowle of Rothelowman Architects who wanted to balance the beauty of an absolutely beachfront location with the site’s constraints and prevailing winds. Pinning the end result on a collaboration of creative innovation, Jonothan said a fusion of architecture and wind engineering was used to craft the unique design into existence. “From the outset we decided to reconsider the typical high-rise apartment tower in order to create an architecture that truly celebrates the idea of living on the coast,” he said. Much like London’s 30 St Mary Axe building and Beijing’s CCTV Headquarters, the tower’s structure will use what is known as a diagrid exoskeleton which is an engineering technique used for managing wind and structural loads in compromised environments. The diagrid ecoskeleton provides torsional stiffness while maintaining the apartment view corridors over the Pacific Ocean. creation of microclimates and allows us to finely tune each apartment for passive solar shading, the creation of garden beds and the possibility of natural ventilation,” Mr Cowle said. “Differing floor plates throughout the tower combined with open balconies at each end disturbs wind flow around the building, reducing the impacts of wind for residents and pedestrians below. “Tethered to the earth and resisting forces, this is one of the few residential towers that derive its aesthetic from its structural expression. The DA number for this development is MCU201700336. Is this Revit-Dynamo or Rhino-Grasshopper or else? Thanks.